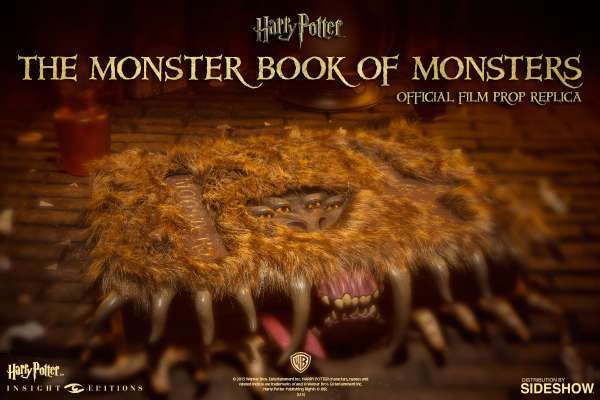 From the moment it was introduced in the early chapters of Harry Potter and the Prisoner of Azkaban, there was no doubt that the Monster Book of Monsters, once brought to life, would be quite the extravagant prop. However, it took over a decade since the release of the third feature, in which the Monster Book was actually brought to life, thanks to Hagrid and a bunch of very disgruntled third year students, for it to be available to the general public - don't call them Muggles, though. It's up for purchase now, thanks to SideShow Collectibles. It's exactly how it looks in the third film, and is a bit furry to the touch - we're hoping it's not real fur, but with Hagrid... There is a bit of an earthy, almost wild-animal smell to it, which, to be honest, makes it more authentic. Unfortunately the only thing it doesn't do is bite and attack. Some might see that as a plus, but personally, with teeth like those, you'd want it to take a nibble at your ankle, just for authenticity's sake. What should be noted is that the book isn't actually... a book. It's more of a wooden jewelry box. It does open, and instead of finding chapters about some of Hagrid's most beloved creatures, it's a hollow box. Think of it something between the Monster Book of Monsters and the ever-reliable Moleskin pouch Harry was given by Hagrid for his seventeenth birthday in Harry Potter and the Deathly Hallows. It's a great place for people to put their prized possesses. And truth be told, how many random people and total strangers would want to touch a book that looks like that? Great for Harry Potter fans, but a bit unnerving, perhaps, to others. 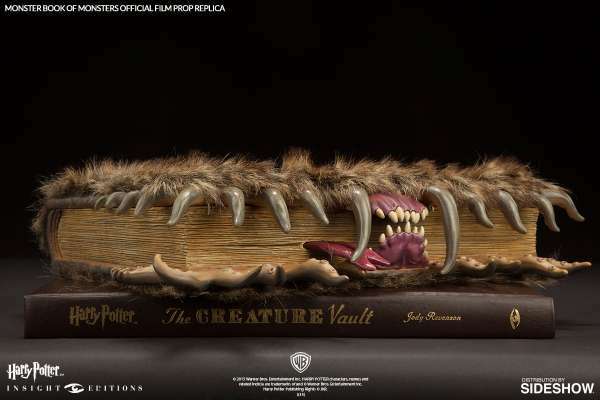 Although it actually isn't a book on creatures, it does come with a a limited edition of Harry Potter: The Creature Vault, which includes an incredible poster on the dragons featured in the film series. So while the Monster Book of Monsters may be a bit pricier in real life than it was in the Harry Potter book series, it comes as a great package deal. And don't forget - always stroke the spine before you even think about having a go at the Monster Book of Monsters, available now.